1.1 The website is owned and operated by Thunders Bakery (referred to as “we”, “us” or “our”), which shall also include our third party suppliers and any other affiliates involved in the maintenance and running of this site. 1.2 Thunders Bakery offers this website, including all information, features services available from this site to you, the user based on your acceptance of all terms, conditions, policies and notices stated here. If you are not in agreement with these terms and conditions, then you should refrain from using this website and its services. 1.3 These Terms and conditions apply to all users of this website, including without limitation users who are browsers, customers, merchants, and/ or contributors of content. By visiting or purchasing something from our site, you engage in our “Service” and agree to be bound by the following terms and conditions (“Terms of Service”, “Terms”). 1.4 By agreeing to these Terms and conditions you represent that you are at least the age of majority in your place of residence, or that you have been given the consent to use, view and transact on this site. 1.5 Those who visit the Site from locations outside of the Republic of Ireland do so on their own initiative and are responsible for compliance with all Irish applicable laws. If the use of the Site or any of information is in contradiction with your local jurisdiction(s), you must refrain from use of this site. 2.1 All content and materials published on the Site are presented to you solely for your private, personal and non-commercial use. All contents of the Site are protected by national and international intellectual property laws, and/or is owned by Thunders Bakery or its suppliers therefore the copying or imitation of these goods, brands and trademarks are prohibited. 3.1 Where content on our website is supplied by a third party that is not affiliated with us, you are aware that Thunders Bakery does not control or monitor this content. As far as we are aware this content is of a good nature however we are not liable for any harm or damages caused as a result of your relationship with a third party website. You are responsible for the risk associated with the use of this site and your interpretation of the information displayed. 5.1 Even though Thunders Bakery will use its best endeavors to site provide you with an error free service this cannot be guaranteed. In some cases the continuous operation of our site my experience some rare unexpected interruptions therefore we are not liable for its unavailability. 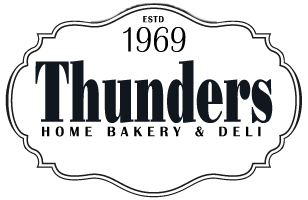 6.2 Thunders Bakery reserve to right to change, replace or remove any part of these TERMS AND CONDITIONS OF USE with no notice required. The site will then be governed by the amended terms when they are made public. Therefore it is your responsibility to check the terms and conditions on the Site regularly. You will find the latest version on this web page. 6.3 Prices for our products are subject to change without notice.We reserve the right at any time to modify the pricing or the range of products we offer. We have the right to discontinue any part of our service or any of our products at any time. We shall not be liable to you or to any third-party for any modification, price change, suspension or discontinuance of the Service.